Founded in Spain, this frozen yogurt chain has taken Singapore by storm. Established in 2009, llao llao became a pioneer in selling frozen yogurt in Spain. 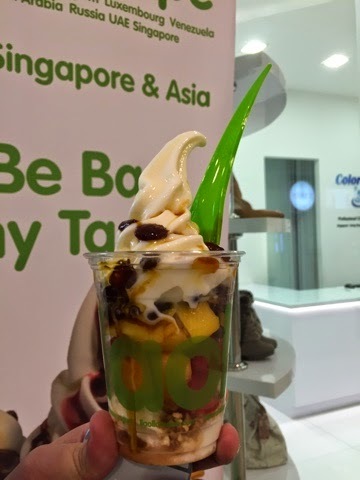 llao llao boasts itself as an affordable product. Priced at S$6.95, you can order a Sanum - a cup size frozen yogurt which allows customers to choose three fresh fruits, two crunch items and one sauce. I happened to stumble upon a llao llao outlet at Marina Link. The queue was rather slow and was a rare sight. Without hesitation, I joined the queue to try the long-awaited frozen yogurt. I have been wanting to try this popular frozen yogurt for the longest time but the queue was always snake-long. The frozen yogurt in terms of taste was normal and nothing to rave for. Unlike Red Mango, the frozen yogurt melted very fast as if it had a lot of water. What was commendable was the wide variety of toppings and sauces to choose from. llao llao is definitely a fad and is a strong competitor of Red Mango. Red Mango is still my best choice for frozen yogurt for its texture, taste and quality.